The South African Revenue Service (SARS) has stepped up their mission to reduce a massive tax deficit, by initiating a campaign with the National Prosecuting Authority (NPA) to prosecute non-compliant taxpayers who have failed to submit returns. This was announced in the media release dated 16 April 2018, indicating various court cases covering multiple parts of South Africa. The statement reads that, “prominent South Africans” as well as normal taxpayers are being targeted for prosecution, and as of April 2018, over 36 dockets have been handed over to the NPA. 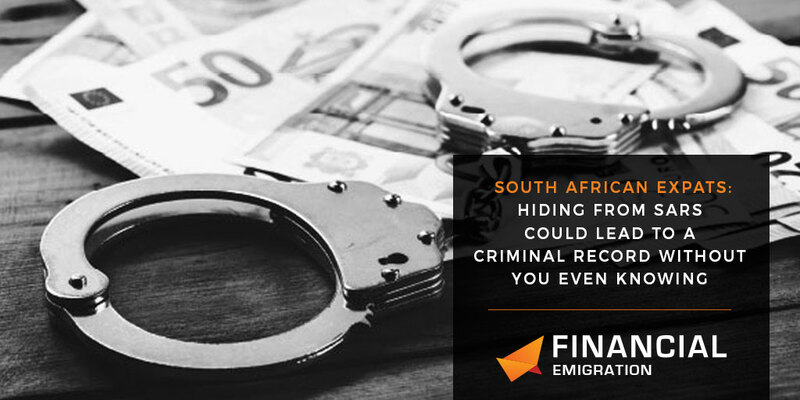 If found guilty, taxpayers WILL end up with a criminal record and sanction includes prison and / or penalties of 200% and / or administrative penalties which can be R16,000 per month. This will be extended to all taxpayers, as SARS has made it very clear that outstanding tax returns will no longer be tolerated and those who are non-compliant should expect the full force of tax law. South African expats often believe that because they have left South Africa, they no longer need to worry about their South African tax profiles – wrong! If you have neglected to submit your tax returns each year, you may be next in the firing line of the NPA and SARS. What is most worrying is that should you be prosecuted, you will have a criminal record and that will affect you being able to obtain visa’s and work permits, or even being able to become a citizen of another country. The recently implemented “Common Reporting Standard” ensures that you will be found wherever you may be in the world. Banking institutions globally will be providing SARS information on the income going into your accounts, and thus you will be unable to hide from SARS any longer. In this day and age, SARS does not forget, and even zero income expatriates will face the wrath of SARS and the NPA should they have outstanding tax returns. Something as simple as your tax returns could potentially derail your entire future abroad. Financial emigration is your safest option to bring your taxes up to date and to close off your tax affairs with SARS. At the very least you should ensure that your South African taxes are up to date which you will need to manage year after year should you not elect to go the financial emigration route.